MD introduces Air Master, a full line of industry popular, bottom-emptying central vacuums. Designed and assembled in the USA, Air Master reflects the craftsmanship and quality known to all MD brands for almost 60 years. In addition to their powerful performance, AirMaster units operate at an extremely quiet level, providing years of outstanding performance. Each Air Master power unit is equipped with a powerful North-American made Ametek motor delivering optimum performance for each home. A full line of varying models, heights, and motor configurations are designed to clean homes from 1,000 sq. ft. to 10,000 sq. ft. The power unit's main body and motor housing are all heavy-gauge steel, while the lower bucket is high-impact ABS to ensure years of reliability. 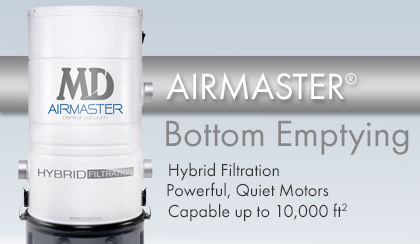 AirMaster's unique hybrid system allows homeowners two choices of filtration. 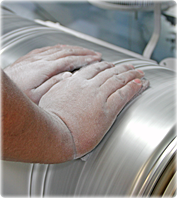 Either reduce maintenance costs by operating solely with the pre-installed inverted Microtex cloth filter (without any disposable bags) or enjoy the convenience and cleanliness of using disposable Micro-X filtration bags to encapsulate all the fine dirt particles. Each model comes with both options.